When Zoho One was launched in 2017, the goal was to give businesses an integrated solution with applications which worked together seamlessly. This is extremely important in today’s digital ecosystem because standalone products are notorious for introducing complexities when it comes to full integration with other applications. The time and cost required to make everything work together results in a company being less efficient, which ultimately impedes growth. Having integrated software removes these complexities and it streamlines the operations of the organization. An integrated system gives everyone in the organization increased visibility, keeps each team member on the same page, and delivers up to date and accurate information. So How Much Better is an Integrated System? First let’s take a look at the problem with standalone applications. When most businesses first get established, they purchase single applications. As they grow, they keep adding new applications as needed. This can include everything from accounting to office applications, CRM, marketing, collaboration, communication and more. What this means is each application has to be integrated with all the other ones or function as a standalone product. Whichever option a business chooses, it will be less efficient. Full integration will require constant monitoring for each update and determining if an existing application will continue to work with all the others. And siloed or standalone apps will always require your staff to do more work separately instead of having everything in one place. In a world where so many components of your business from your brick and mortar location, to your website, ecommerce, social media, CRM, user experience, team collaboration, and remote workforce must work together, full software integration is essential. This is because every piece of data a business generates today can be analyzed to provide insight and deliver better products and services to customers as well as improve operations. If this data can’t be aggregated efficiently and analyzed, it presents yet another problem a business has to deal with when choosing standalone or siloed applications. This is not to say your data can’t be analyzed, but it will take more time and employee hours to make it happen. And these are resources a small business or any business for that matter can ill afford to waste. Put simply, an integrated system will save you money and make your business more productive. The benefits start with not having to buy, install, integrate and maintain different solutions or standalone applications for different parts of your business. As a company, you will spend less money on IT, which can go to other segments of your business operations. Once you have an integrated system, your business will be more efficient at processing daily operations and improving visibility. If everyone is using the same system, decision makers can access the data they need in real time and know it is up to date and accurate. Moreover, this information can be accessed with greater ease from anywhere, anytime and on any device. When you are ready to grow and expand, it is that much easier to take an integrated system and apply it to new locations. You will be able to train new employees on a single platform, which will make it much faster to adopt so you can get new operations up and running in less time. Training is a key component of Zoho One. The company provides continuous free training for new customers and those considering Zoho, which is now taking place across the US. Zoho One is a full-featured all-in-one cloud app suite to run your entire business. It comes with the enterprise edition of 40+ Zoho applications covering a wide range of use cases, with one admin panel including overarching analytics. When it was first introduced in 2017, Zoho One, which billed itself as ‘the operating system for business’ wanted to give companies a one-stop solution for their digital business needs. The suite has a broad ecosystem designed to improve overall operations. This includes communications, sales, back-end-processes, help desk, HR, Zoho Office Suite, accounting, CRM, mobile applications and much more. 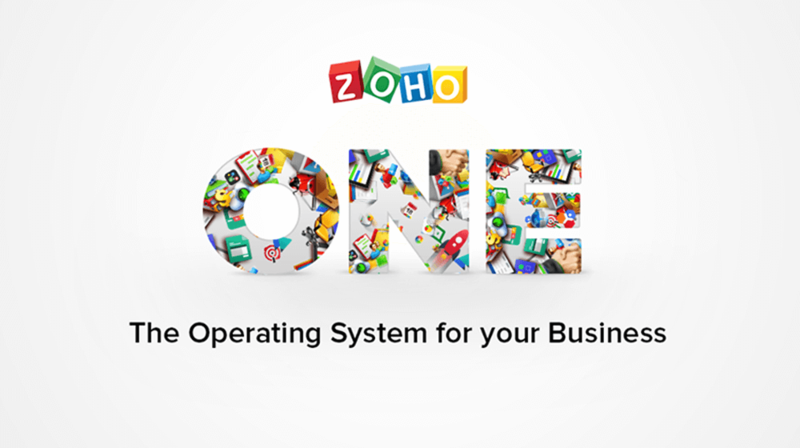 For small businesses looking for an integrated system, Zoho One offers a viable solution even startups can afford.